Twelve enemy shelling attacks were recorded. 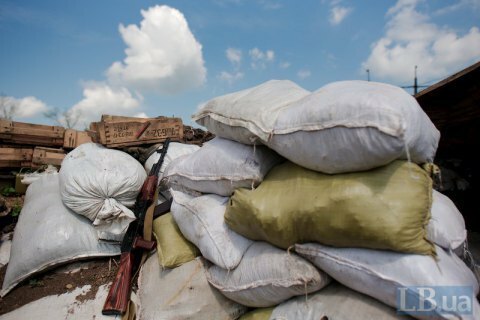 Over the past day, ATO headquarters recorded 12 breaches of the ceasefire regime by militants in Donbas. Not one Ukrainian soldier suffered in the attacks. The lion's share of enemy armed provocations were after dark, ATO headquarters said in a Facebook statement on Monday, 27 November. In the Luhansk sector, the enemy fired infantry weapons at on the positions of Ukrainian military mainly. In particular, the enemy fired rocket-propelled grenades and small arms at the defenders of Zolote, Svitlodarsk, Zhovte, Mayske and on two occasions - Krymske. Around noon, the Russian mercenaries several times fired 82-mm mortars in the area of Tryokhizbenka. In the Donetsk sector, the militants shelled from 82-mm mortars the Ukrainian support points at Verhnyotoretske and Vodyane. The militants fired infantry weapons at Ukrainian positions in the suburbs of Avdiyivka and Maryinka. In the coastal area, the adversary fired anti-aircraft guns and small arms at Hnutove. In the Avdiyivka area, enemy UAVs were spotted several times during the day. On Saturday, two Ukrainian soldiers were killed and four wounded in the area of Verhnyotoretske.